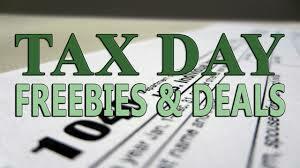 Tax Day Restaurant Deals April 15, 2019! BJ’s Restaurant & Brewhouse: Get half-off large deep dish or Tavern-Cut Pizzas Monday for dine-in, take-out or delivery. April 15 also kicks off three weeks of free delivery and no service fee on delivery orders through the BJ’s website. Learn more at www.bjsrestaurants.com/freedelivery. Bite Squad and Waitr: The online and mobile food delivery services are offering “no delivery fees” when customers spend $20 or more on food with promo code TAXDAY19 for orders placed on the services’ apps or through the links above. Farmer Boys: Get two Breakfast Burritos or two Double Big Cheeses for $10.40 Monday at participating locations. No coupon required. 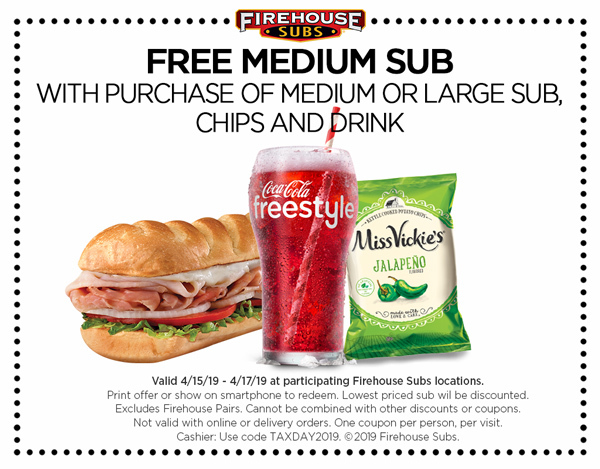 Firehouse Subs: Get a free medium sub with purchase of a full-price medium or large sub, chips and a drink April 15-17 at participating locations with this coupon that can be printed out or shown on a phone. Great American Cookies: The national gourmet cookie shop continues its annual Tax Day tradition. Get one free Original Chocolate Chip Cookie at participating locations for stopping by. Hardee’s: The fast food chain is giving away free sausage biscuits from 7 to 10 a.m. Tax Day at participating locations. To get this freebie, you need to say, “Made from scratch.” One per customer, while supplies last. Tax not included. Noodles & Company: Members of Noodles REWARDS will get $4 off online and mobile orders of $10 or more for Tax Day. The offer is valid from April 10-15, but to get the offer you need to be signed up for the program by April 9. Sign up at www.noodles.com/rewards. Smoothie King: Get $2 off any 20-ounce smoothie April 15-18 with Smoothie King’s Healthy Rewards app. Sign up for the app at www.smoothieking.com/healthy-rewards. White Castle: For Tax Day, the fast-food chain will offer 15% off any order in-Castle with a coupon that will be posted on social media pages and sent to email subscribers.